It seems like yesterday that Saoirse Ronan first made a splash in Atonement, the Oscar-nominated adaptation of Ian McEwan’s bestselling novel. Just 12 at the time, and with barely any prior acting experience, she was able to steal scenes from the likes of James McAvoy and Keira Knightley, even earning an Academy Award nomination for Best Supporting Actress. Since then, she has gone in no other direction than up, working with directors like Peter Jackson, Andrew Niccol, Wes Anderson and Peter Weir, obtaining two more Oscar nods for her roles in Brooklyn and Lady Bird, and always gaining positive reviews for her performance, regardless of the film’s quality – and all before her 24th birthday. She is a major talent in every which way, and to think it all started with her breakthrough performance in an Ian McEwan adaptation just over a decade ago. Now, things have come more or less full circle for Ronan, as she plays a much more adult role in another adaptation of a McEwan source, this time of the author’s novella On Chesil Beach. Needless to say, she is as excellent here as she always is, but the film as a whole just can’t quite catch up to her natural greatness. We first meet Ronan, who plays a young woman named Florence, as she arrives at a small hotel in Dorset with Edward (Billy Howle), the man who earlier that day she had gotten married to. The couple clearly adore each other, in their own awkward way, but when it comes time to consummate the marriage, Florence is having absolutely none of it. This is when the film frequently tends to flash back to fragments of their courtship which, this being 1962 – when Britain was just on the verge of a cultural revolution – is noticeably dry and reserved, complete with stiff upper-lips and hesitance to new music by the likes of Chuck Berry and Elvis. The scenes in the hotel, where the couple awkwardly try and seal the deal, are a mere framing device with a majority of the film consisting of these flashbacks, as we see their own troubling family lives, including his mother (Anne-Marie Duff) who after an accident is left with serious brain damage, and her parents (Emily Watson and Samuel West) whose upper-class attitudes and snobbish sentiments contrast greatly with Edward’s working-class background. That also forms into the film’s biggest problem, which is with its structure. McEwan’s original novella is only 166 pages long, and is set almost entirely during that wedding night in the hotel; the flashbacks in this film, which McEwan also provided the screenplay for, were added to expand on the couple’s backstory and to show their initial character flaws in a bit more detail. In an adaptation of anything, it’s completely understandable as to why a screenwriter – who in this case is the author himself – would choose to add these extra bits to flesh out the characters and story a bit more, but the way they are incorporated into this film isn’t very successful, as most of the transitions from the movie’s present (the stuff in the hotel) to its past are sporadic and even random, often altering the overall tone and pace that the scene has established already. There could be a scene of the married couple trying to ease the pain on their wedding night, and then out of nowhere it will cut to a moment where Edward’s mother is outside, completely naked; random cutaways like that can cause a slight tonal whiplash, and make you think you’re watching a more reserved version of Family Guy rather than this respectful British drama. It does this a lot throughout the movie too, and you question as to why McEwan decided to structure his own adaptation in this way if all it does is render the storytelling a lot more confusing and disjointed. The fractured way in which this film tries to tell its story only highlights rather than hides how, when you analyse it a bit, it is a rather emotionless and shallow story altogether. Though it is interesting that it is about a young couple who are products of the prim and proper Establishment of the time, and are perhaps a bit too old and traditional to fully experience the cultural and even sexual revolutions that the Sixties would later provide, the central relationship feels very dry because, as hard as both Ronan and Howle try, they cannot seem to form a legitimate chemistry with one another, and you do get the feeling that this is more of a coupling of convenience than actual compassion. When they do come to a head with one another about their respective sexual frustrations, it ends in a way that makes neither party look good, even when it is strongly hinted that there may have been a case of sexual abuse in one person’s past. You end up feeling nothing for these people as they go through their problems, even though again you have actors like Ronan and Howle who are very good at conveying powerhouse emotions, but no matter how strong they are in this film it isn’t enough to see the shallowness that lies in this story, and especially its final few scenes which go a little too far, especially when you see this youthful actors in ridiculous old-age prosthetics and make-up. This is a film that desperately wants to be a powerful character drama, but it misses the mark more often than it actually scores. Though it is a very well-acted film, and there is some decent cinematography, it really doesn’t work as a feature because the script moves itself around too much for us to really care, which results in a very dry and emotionless experience which, given the talent involved on-screen, least of all the ever-excellent Saoirse Ronan, makes it a damp disappointment. 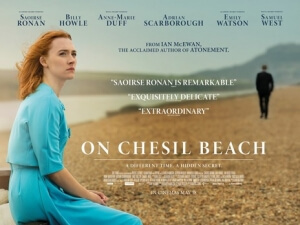 On Chesil Beach makes as much use of the ever-excellent Saoirse Ronan as it possibly can, but the film largely falters thanks to a fragmented and shallow script that only highlights how emotionless this story and set of characters are.